Newfoundland-Labrador picked the short straw, facing favourites Alberta in the opening draw of the 2011 Canadian Wheelchair Curling Championships that began this evening in Edmonton. They held Alberta to a single in the first before the wheels fell off and a series of steals saw Alberta post 11 points before conceding a consolation single in the 6th and final end. Home Host Team Alberta faced Ontario and started strong, scoring one with hammer in the 1st then adding a steal before seeing the game tied at two at the break. They then shocked Ontario with a four and a steal to go ahead 7-2. 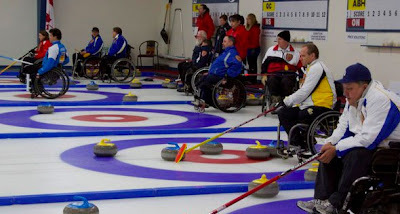 Ontario attempted a comeback, scoring three in the seventh but the Host Team took the victory 7-5 when they ran Ontario out of rocks in the final end. Manitoba took a while to get going against Northern Ontario, falling behind 3-1 early before edging ahead 4-3 at the break. The game was decided in the 7th when Ficek's last rock was a little heavy and ran through the curl, allowing a steal of 4 and Manitoba a 9-5 win. Quebec gave up a steal in the opening frame against Nova Scotia but pulled ahead with a three in the second, going into the break with a 4-2 lead. It was short-lived however as Nova Scotia scored the next four points to pull ahead. A single by Quebec in the 7th was not enough to avoid a 6-5 defeat as Nova Scotia ran them out of rocks in the 8th. Saskatchewan gave defending champions BC all they could handle scoring the first points of the game but not until the third end. An exchange of singles had BC down by two in the 8th. BC skip Cormack had a chance to win in regulation after Saskatchewan's Darwin Bender's last rock chipped a guard, but his wide open draw to the four foot was short and he had to settle for two, forcing an extra. BC opened the extra end with a stone touching four foot, then guarded after Saskatchewan's early draws were heavy. Their final stone attempted to come through a port but hit a guard and BC ended up stealing two for the 6-4 win. BC about to throw final guard of their stone touching 4 foot.